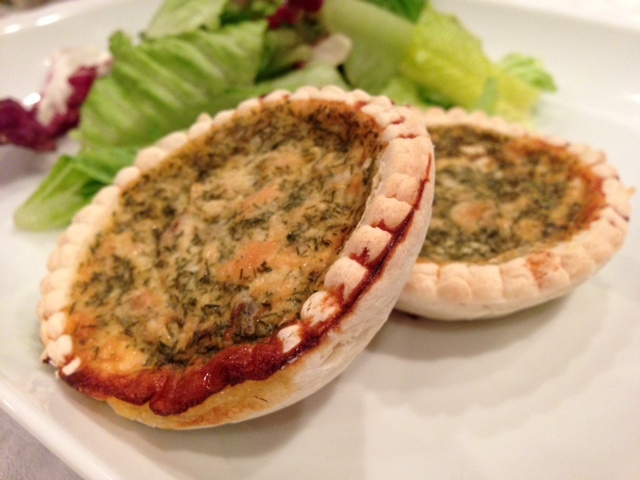 Quiches are staples in France. We eat lots of quiches. They are easy to make, they cook fairly fast and they make for some yummy dinner or lunches. We like to eat quiches in France because they are very very inexpensive to make and they allow you to use whatever you have in your fridge. 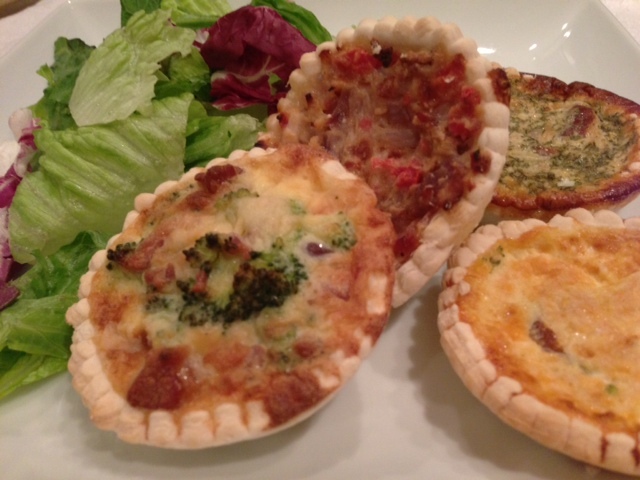 Did you know that “although quiche is known as a classic French dish, the quiche originated in Germany. 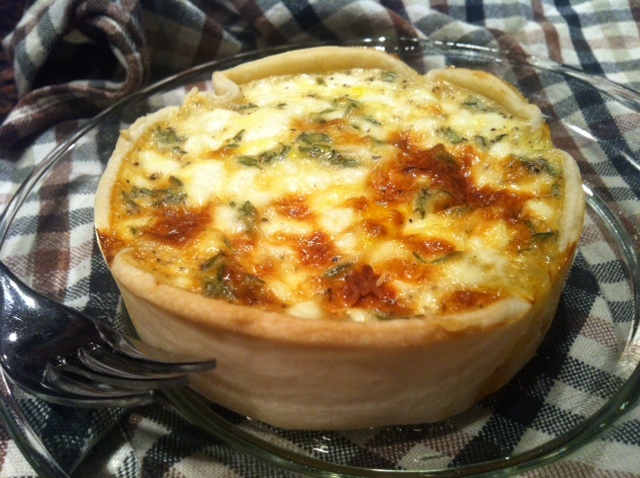 The word quiche means “cake” which came from the German word Kuchen. 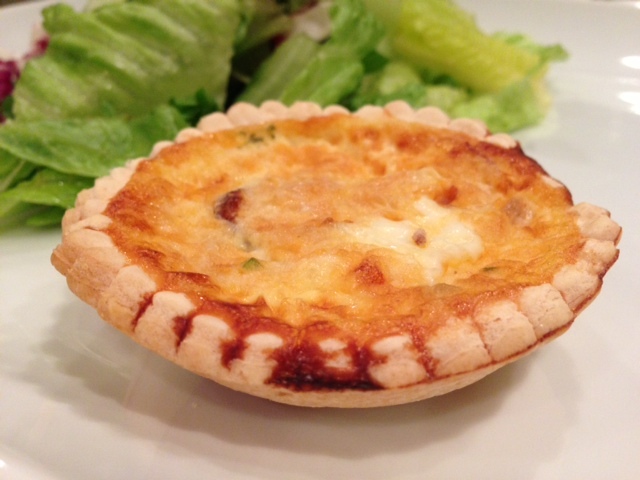 Today, quiche is considered as typically French. 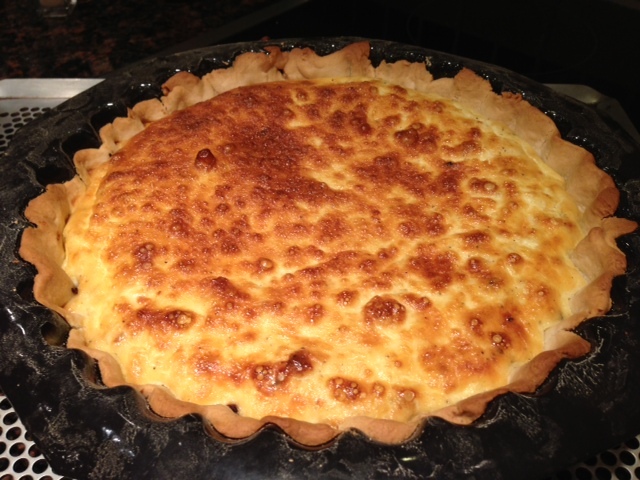 The most popular quiche is quiche lorraine. 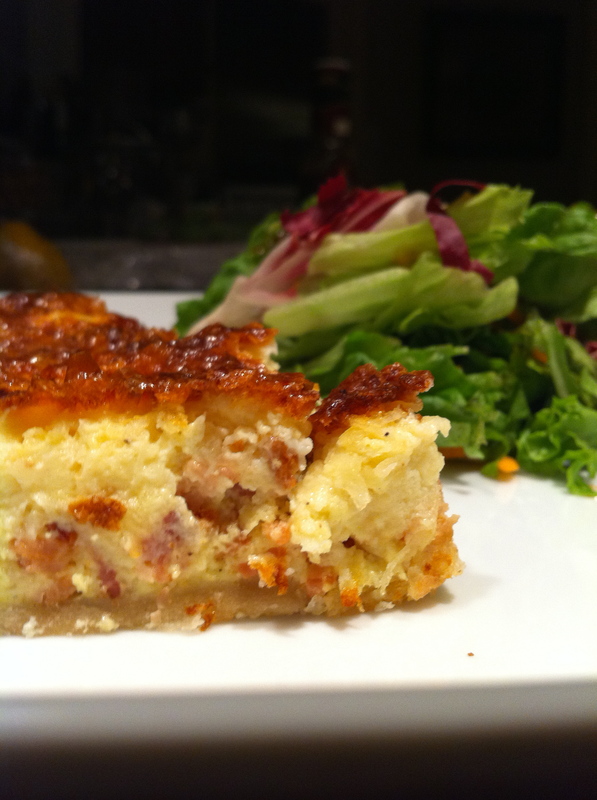 Quiche lorraine is a quiche with smoked bacon or lardons. It was only later that cheese was added to the quiche lorraine. The addition of Gruyère cheese makes a quiche au gruyère or a quiche vosgienne. 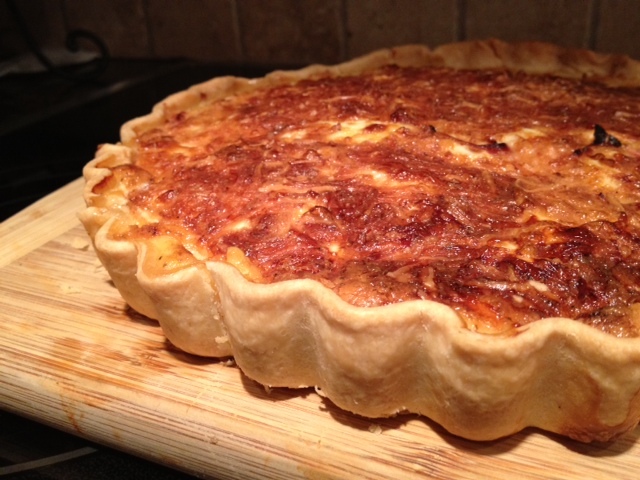 The ‘quiche alsacienne’ is similar to the ‘quiche lorraine’, though onions are added to the recipe.” Wikipedia. 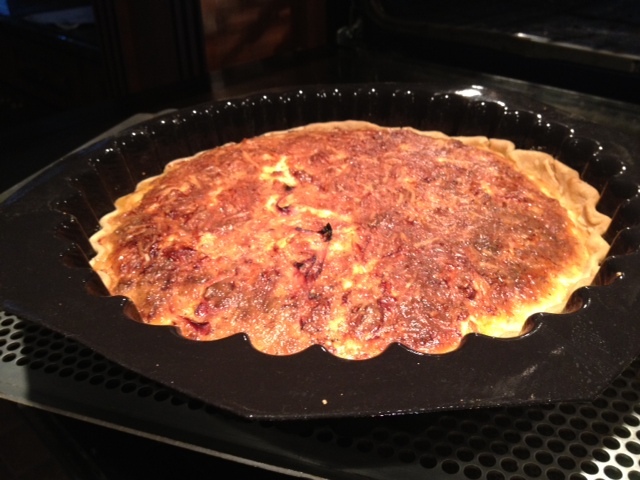 Well today I will present a very easy recipe of quiche lorraine. We cheated here with the dough as we bought one instead, but making the dough from scratch would add considerable time to this recipe. Mix all the ingredients together, and set aside. Place the dough inside the large round mold, or inside the tart mold. With the fork, puncture the dough to allow the air to come out and your dough will not bubble during baking. Cook in an already warm oven at 400 for 25 minutes. After spending a week having copious breakfast, I tried to resume to my school breakfast this Monday ( smoothies or cereal bars), but was not satisfied and was famined by the time 10am came. So last night I decided to make some crustless quiches. 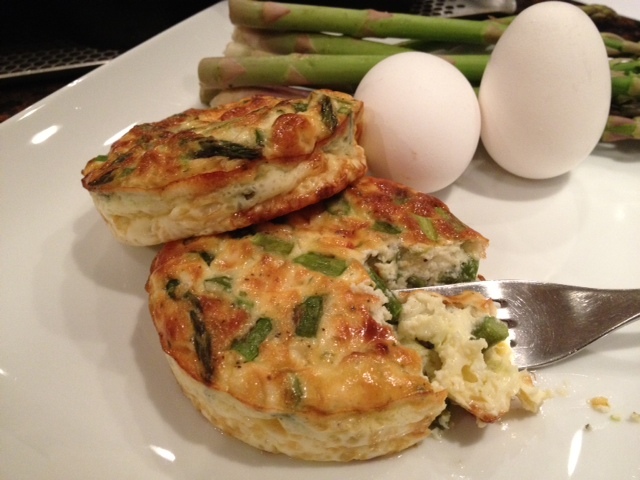 At first I thought of making one of my favorite, Asparagus and Boursin crustless quiches but since I had other ingredients on hand, i decided to play a bit. My quiche may not look that appetizing, but it was very good and very satisfying. I think next time I will however place arugula at the bottom of the quiche and not at the top for esthetic reason. Place the large round tray on a medium perforated sheet. Divide the ham among each round. 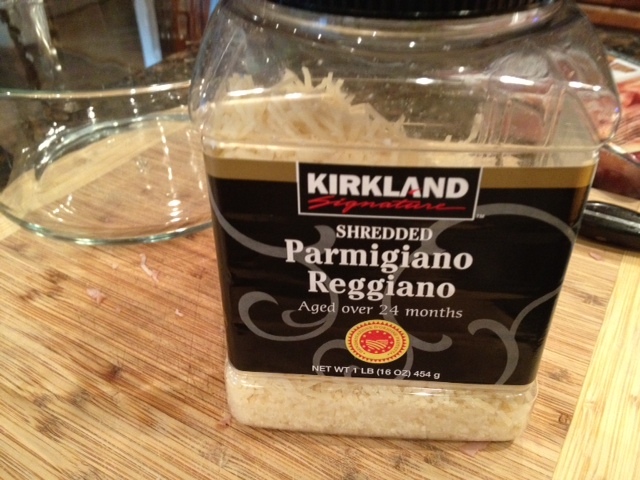 Continue with the parmesan and finally the sun-dried tomatoes. Divide the arugula equally in each round. In a large bowl, beat together the eggs and the milk. Season lightly with some pepper. Pour the egg mixture in each round equally. 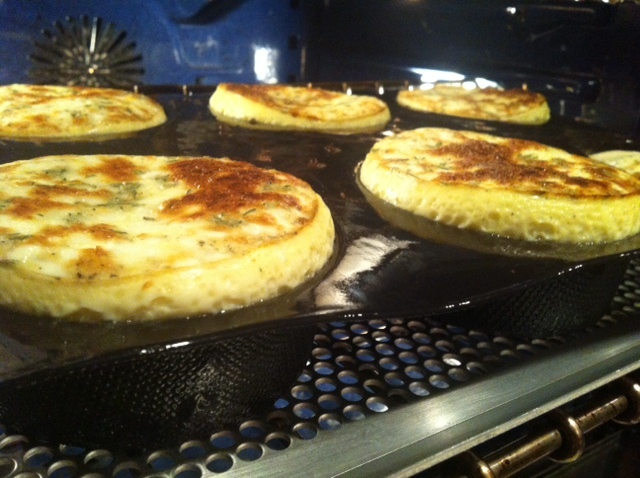 Bake in a warm oven for 25 minutes. Of course I could have left those things alone, and just taken the left-overs out but I reasoned that making quiches would only take a minute….and instead I set myself to make quiches with all those wonderful things…. I made 5 kinds of quiches: Smoked Salmon, Quiche Lorraine with Bacon and Emmenthal, Bacon, Broccoli and Smoked Gouda and Smoked Salmon and Dill, Tomato, Bacon and Purple Onion. Roll the dough out on the roulpat and with the large dough cutter ( 3 7/8) cut twelve tartlets. Place the tartlets in the opening of the large tartlet mold. With the shaper push the dough down ( such a great tool!, you can push the dough down in seconds while it would take longer using your fingers). 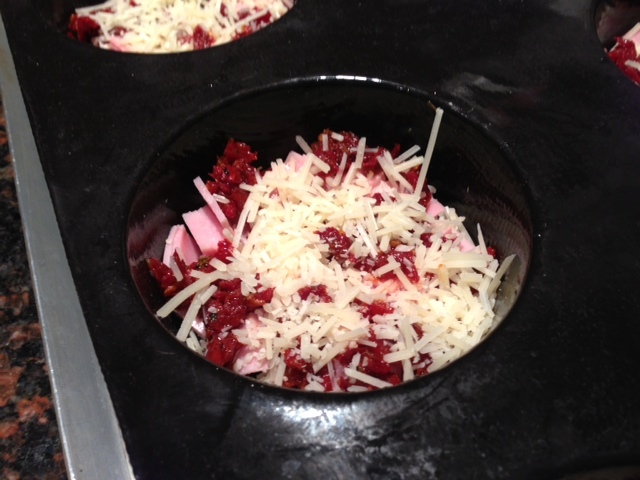 Then set aside to prepare the filling. In a large bowl crumble the salmon ( I used the Hickory Wood Flavored Salmon from Costco. It was delicious). Mix all the ingredients mentioned in the list above and mix well. Pour the mixture into each tartlet, making sure to scoop the salmon up so that all tartlets have salmon. Cook in the oven at 400 for 20-25 minutes or until the pie dough is golden. 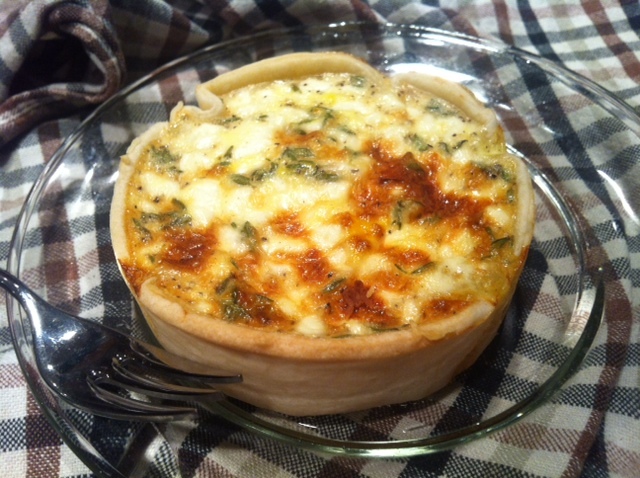 You may also cook the Smoked salmon quiche in a 9 inch tart mold, and in this case it would take 30 to 35 minutes. For the Dill/ Smoked Salmon Quiche, just add 1 tbsp of the dill Demarle Herb mix to the egg mixture, stir well, pour it in the pie crust and bake for the same amount mentioned above. Eat with a green salad, et voila!!! When I came home this past Tuesday during my lunch break, my whole family greeted with warmth but said: ” Cecile, can you please take us to the store, there is nothing to eat…” “Nothing to eat?? ?, what do you mean, there is nothing to eat.”: I replied, and as I answered I went to see what i could find in my fridge to fix lunch. I found a ton a things: cucumber, tomatoes, ham, cheese, and plenty more. So much so, in fact, that for lunch, we had cucumber salad, tomato caprese, quiche, lamb, grilled sausages and pasta. Quiche is one of those wonderful things that you can fix quickly and use whatever you have in your fridge so long as you have cheese. Ingredients: 1 pie crust ( pre-made), 5 eggs, 1 1/2 cup of heavy cream or milk ( if you use 2% milk, or non fat, you will need to add another egg because of the water content), 1 cup of shredded parmesan, 1 cup of sharp cheddar, 1/2 tsp of salt, 1/4 tsp of pepper. Place the pie crust in the pie mold, and prick the bottom with the fork. 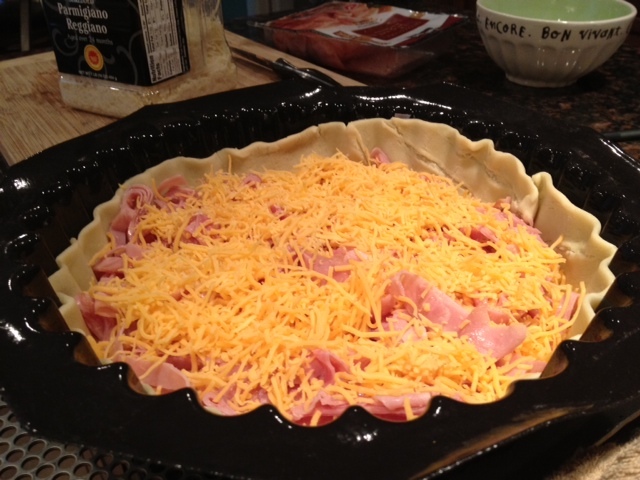 Cut the ham in small strips and disperse them all over the pie, do the same with both cheese. In a bowl, crack all 5 eggs, add 1 1/2 cream ( or other milk product you are using), the salt, the pepper and mix well. 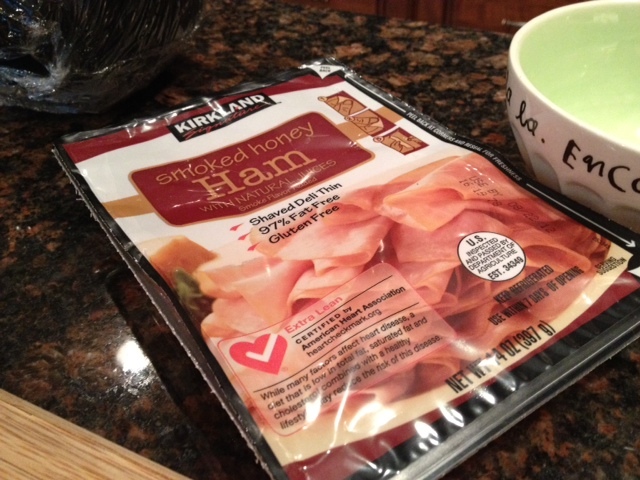 Pour the mixture over the ham and cheese. 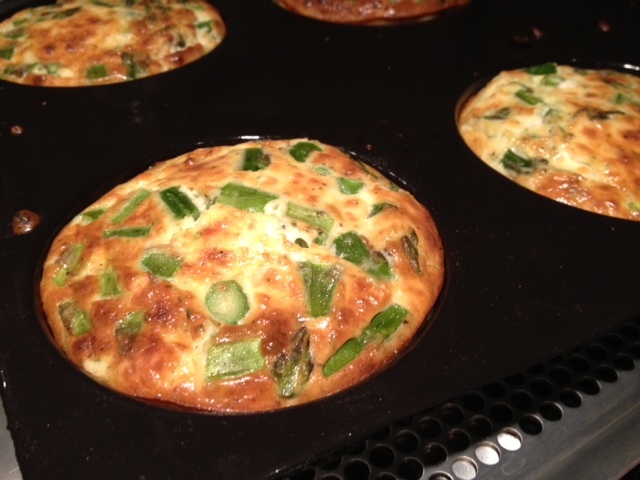 Place in the oven and cook at 375 for 35-40 minutes or until the center of the quiche is no longer wobbly. Ingredients for 12 cupcakes size quiches or 6 larger one: 6 eggs, 2 cup of milk ( or skim milk, or even heavy cream), 30 asparagus, 1 boursin cheese ( I used parsley and garlic, but shallots would work well as well. 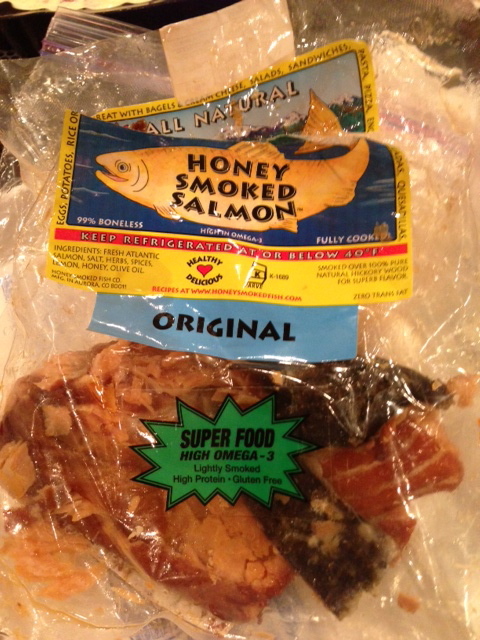 ), 1/2 tsp of salt, 1/4 tsp of pepper. Trim the end of the asparagus by breaking them. Then cut the asparagus in 1/2 inch segments. 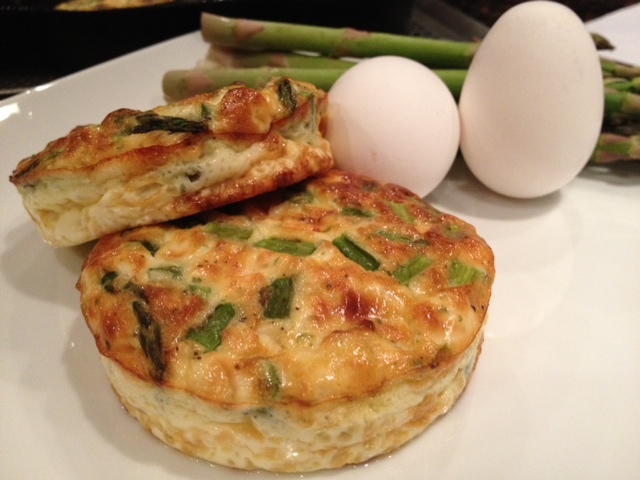 Place the asparagus in the round mold, cover the mold with the silpat and cook in the microwave for 2 minutes. Divide the asparagus equally in the tray that you will be using. 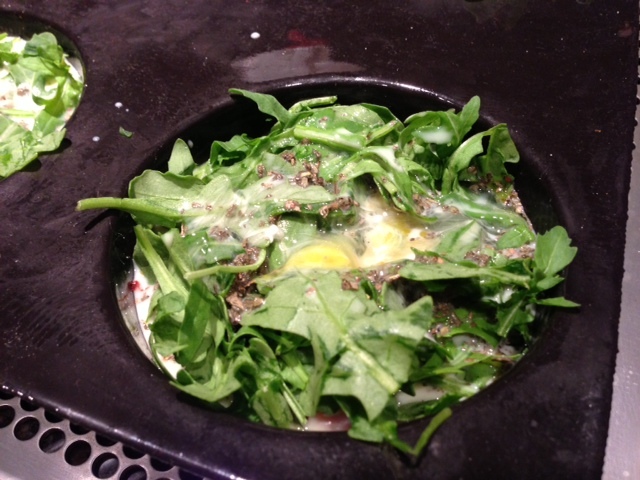 In a large bowl, break the eggs, add all the other ingredients and stir to mix well. Empty the content equally in each opening of the tray and cook for 15 minutes. 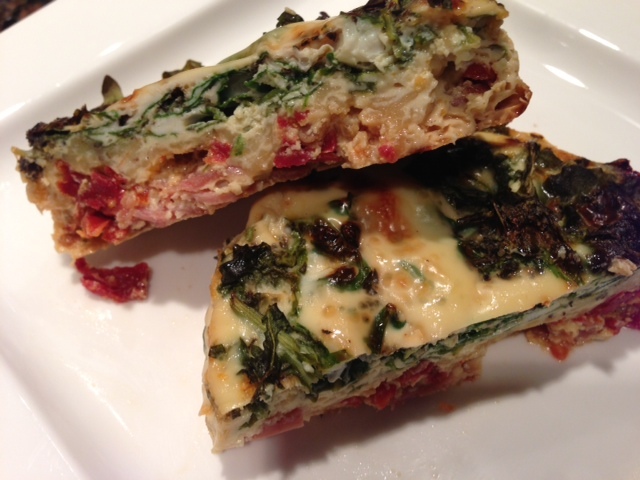 Eating those quiches in the morning have been a blessing:-) no more time wasted in the morning to figure out what’s for breakfast and even though those quiches are very filling, they are so easy to digest and I don’t feel like a ” stone” is in my stomach. And I actually look forward eating them. Often I just eat just because you have to eat, it is healthier but I actually look forward my little quiche in the morning. 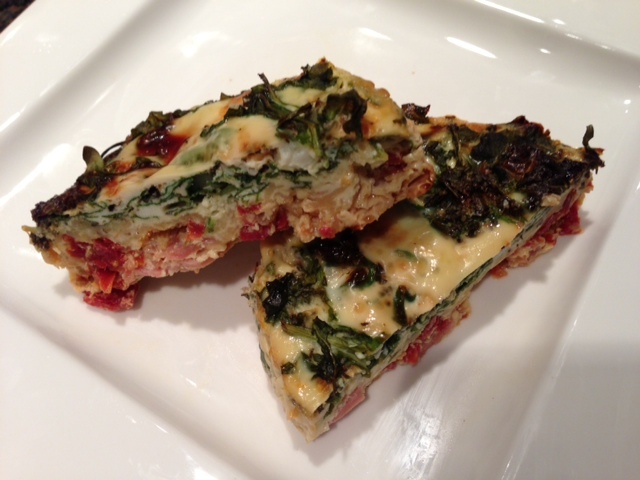 Today I thought I would try another recipe which what was in my fridge: Sundried tomatoes and goat cheese. Ingredients: 1 package of pie crust, 5 eggs. 2 cups of milk ( skim, whole, or even heavy cream), 5 oz of crumbled goat cheese, 3/4 to 1 cup of Sundried tomatoes well-drained( conserved in olive oil), salt and pepper, about 5 fresh sprigs of thyme that you would have removed the leaves from. With a fork, perforate the dough so that the crust won’t make an air pocket while it is cooking. 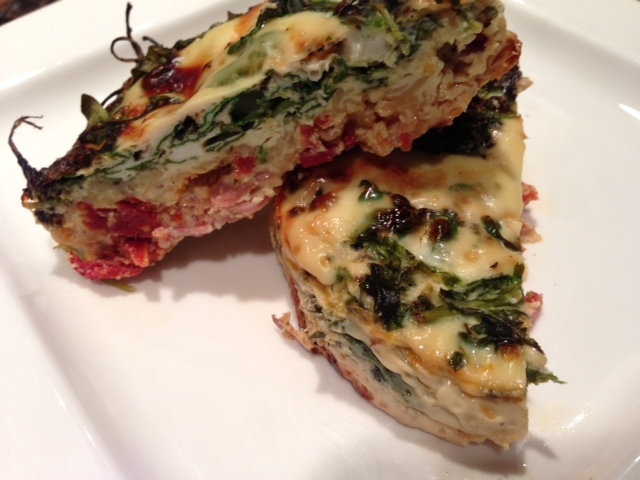 You don’t have to use pie crust if you did not want to.., you could eliminate it to make crust less quiche. Divide the Sundried tomatoes equally in each opening. And do the same with the goat cheese. Set aside. Bon appetit and Happy Cooking!!! !